This post is more of a “Guide to Guides” to the Lunar Festival. New Elders have been introduced with Cataclysm, meaning there are now 84 Elders to honor. Honoring Elders awards a Coin of Ancestry and coins can be redeemed for various items, including pets. The Lunar Festival returns to Azeroth in a cascade of pyrotechnics on Sunday, January 22! With the start of a new year, elders of generations past manifest around the world to impart their wisdom upon all who would listen. Should you encounter these venerable spirits in your travels and take the time to heed their wisdom, they may even pass along tokens of their gratitude — Coins of Ancestry, the lessons of a past age in physical form. Gather enough of these Coins of Ancestry and the Cenarion Circle will open to you their stores of celebratory fireworks, trinkets, garbs, and recipes! The Cenarion Circle have even more cause to celebrate this year than any previous, for this year also marks the first Lunar Festival since the return of many Ancients that had fallen in battles past: Goldrinn, Malorne, Aviana, and Cenarius himself. But this celebration is muted by the eternal torment of one of their own — Omen, blessed by the moon goddess Elune, has risen again from the depths of Moonglade’s lake. Driven mad by the Burning Legion’s tainted magics during the War of the Ancients, Elune’s blessing of immortality means that he will forever be cursed to return in his maddened state at the advent of a new year. Heroes are called to help ease this tormented Ancient’s suffering, in the hopes that perhaps next year will see him return with a clearer mind. Today, the Lunar Festival is held by the druids of Nighthaven. Both the Horde and Alliance are welcome to celebrate and shoot fireworks — a symbol of Elune’s power. Ancient heroes of the past also appear throughout the land, offering gifts to those who find and honor them. Omen, defeated so many centuries ago, yet remains in Lake Elune’ara. Although driven insane by the Burning Legion, the demigod still possesses Elune’s blessing and thus is immortal. During the Lunar Festival, he stirs…and heroes of the land are called to defeat him once again. 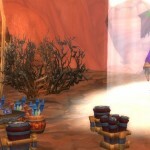 Lunar Festival events focus on the celebration of the ancestors of the inhabitants of Azeroth. Quests can be found throughout the world offering holiday-related items such as fireworks and other memorabilia to celebrate one’s elders and ancestors. Elder Ghosts are found throughout the world of Azeroth and each time players finds a new Elder, they receive a token that can be redeemed for special holiday-related items. 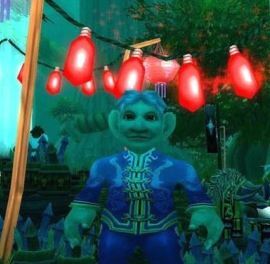 Click here for the Wiki page for the Lunar Festival – it includes quest, events, items, and more. WoWhead News has a pretty complete guide to the Festival. The Lunar Festival is held every year starting on a date that typically coincides with the Chinese New Year. 2012’s Lunar Festival starts on January 22 at 2:00 AM and ends on February 12 at 2:00 AM. Ancestors of Azeroth are praised and honored by both Horde and Alliance, who then reward players with a special title, Elder <Name>, a celebration in Moonglade, and numerous Coins of Ancestry that can be used to purchase festive garb, patterns and fireworks! Elders of Cataclysm introduces 9 new elders to visit and honor–bringing the total numbers of elders up to 84. Lunar Lantern and Festival Lantern are new faction-specific vanity pets that cost 50 Coins of Ancestry each. Ashelia and I will be updating the guide again when the holiday goes live–map coordinates for the new elders, screenshots of the event, and any other changes we find. The Lunar Festival is one of WoW’s more fun and forgiving holidays, and this year it runs from Sunday, Jan. 22 until Sunday, Feb. 12. That’s right, folks; you’ve got three weeks to get everything done, which is definitely a good thing if you’re new to the holiday and unfamiliar with the amount of travel time it requires. The basics of the holiday involve talking to a number of elders to honor them, receiving Coins of Ancestry in return, and then using the coins to purchase holiday items. The To Honor One’s Elders meta-achievement is also a requirement for What A Long, Strange Trip It’s Been, so if you’re still after a Violet Proto-Drake, make sure you get this done. The Lunar Festival is definitely not one of Azeroth’s more difficult holidays, but it’s time-consuming if you’re starting from scratch due to the number of NPCs you’ll need to hunt down. However, it’s also a good time to do World Explorer and Surveying the Damage for just that reason.